Photo: Bethel Green (James Bumgardner House), ca. 1857, Route 701, Greenville, VA. Listed on the National Register of Historic Places in 1982. Photographed by User:Philip N. Wheeler (own work), 2015, [cc-by-3.0 (creativecommons.org/licenses/by/3.0)], via Wikimedia Commons, accessed September, 2016. The Augusta County Courthouse is located at 1 East Johnson Street, Staunton, VA 24402; phone: 540-245-5321. The Shenandoah Valley, including the area that is now Augusta County, was for many centuries a hunting ground for a variety of Native American tribes, including the Shawanese, Tuscaroras, and Senedos. These tribes enhanced the natural productivity of the land by regularly burning the dry grasses of the valley floor in the autumn in order to promote the growth of pasture for the production of wild game. Shenandoah, or Sherando, is a native word meaning "beautiful daughter of the stars." The Valley was first visited by non-native settlers in 1716 when Colonel Spotswood's "Knights of the Golden Horseshoe" discovered it during an expedition. In 1732, 16 families from Pennsylvania crossed the Potomac River and settled in the northern part of the Valley near what is now the City of Winchester. Settlement continued as word spread about the natural abundance of the Valley and in 1738 the General Assembly found reason to establish Augusta County as a distinct governing entity, separate from Orange County. The county appears to have been named for Princess Augusta, mother of King George III and wife of Frederick Lewis, then Prince of Wales. Frederick County, Virginia was established at the same time. The original western boundary of the county was the western edge of Virginia, which at the time was the Mississippi River. The boundaries of the county were set at their present location in 1790. The first settler of Augusta County was John Lewis, who was born in Ireland and educated in Scotland, and who settled in what is now the City of Staunton. Lewis was followed by other Scotch-Irish settlers, and soon thereafter by Germans and those of German lineage from Pennsylvania. In 1745, once the population had grown large enough to support a local government, the county seat was organized at Staunton. Much of what is Augusta County today was part of the Beverley Manor grant from Governor William Gooch to William Beverley in 1736. 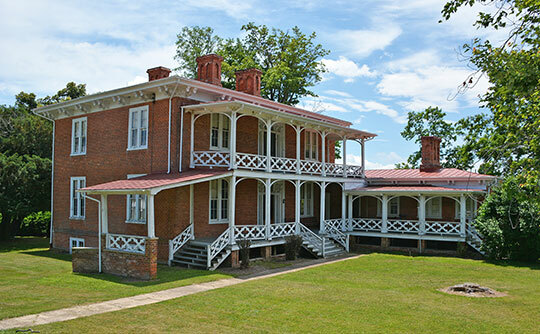 The grant consisted of 118,491 acres of land and was followed by a 500,000-acre grant to Benjamin Borden, however most of that grant was for land in present-day Rockbridge County. Beverley and Borden were encouraged by the terms of the grants to bring additional families to settle the land. The Valley was the site of substantial action during the Civil War, resulting in extensive damage to farms and infrastructure. Battles were fought in and around Augusta County in 1862, 1864, and 1865. The cities of Staunton and Waynesboro developed in close conjunction with Augusta County. Staunton was established as a town in 1761 and incorporated as a city in 1871. In addition to serving as the county seat and a center of local commerce, Staunton became an educational center as well, with the establishment of the Virginia School for the Deaf and Blind in 1839 and Mary Baldwin College, a private college for women, in 1842. Waynesboro was established in 1801, became a town in 1834, and was incorporated as a city in 1948. With its location at the intersection of two major railroads, Waynesboro became an industrial center by the late 19th century. There were also several major transportation corridors through the county that helped contribute to settlement. Route 11 began as an Indian trail, then changed to the Great Wagon Road, and finally became known as the Valley Pike, which was used to transport settlers and goods out west. The Staunton-Parkersburg Turnpike was also a major route. Augusta County continued to prosper as an agricultural and manufacturing center into the 20th century. During the second half of the 1900s, the two cities continued to develop and mature, two interstate highway links were built through the county, the agricultural base further developed and the area became widely recognized as one of the outstanding natural, historic, and recreational areas in the nation. The county has established and maintained a high quality of life for its citizens through an extended period of steady growth in both jobs and population. Augusta County Board of Supervisors and Planning Commission, Comprehensive Plan, Volume 2: Update, 2007, www.co.augusta.va.us, accessed September, 2016.